One can consider investing in the Religare PSU Equity Fund. Religare Mutual Fund has come out with a New Fund Offer named Religare PSU Equity fund. Religare AMC post its acquisition of Lotus AMC in Dec 2009, has seen its AUM grow 4 fold to Rs. 14,700 crores, over a 10 month period. The fund seeks to invest in Companies where the Central / State Government(s) has majority shareholding or management control or has powers to appoint majority of directors. The fund will invest 65 per cent of its assets in companies in the BSE PSU index and the remaining 35 per cent in other PSU companies. The fund will also participate in forthcoming IPOs of Government companies. In addition, the Fund mandate has been carefully thought through and provides the flexibility to hold up to 20% of the companies even after the Government exits or becomes a minority shareholder, past examples being Hindustan Zinc and Maruti. The fund will adopt a bottom up & top down approach to create a diversified portfolio of stocks. The fund will have no capitalization bias and will be style neutral. Religare PSU Equity New Fund Offer opened on Tuesday September 29th 2009 and will close on October 28 2009. Valuation wise PSU Companies are available at a discount of approx 25% to Sensex, giving adequate comfort in terms of safety. Govt's disinvestment programme will be a good booster for PSU companies. The disinvestment will also improve the free float which will in turn improve their weightage in Nifty, forcing Funds across the World with India exposure to increase exposure to PSUs and giving their Stocks a boost. Lesser Govt intervention is helping manage the PSUs more professionally thus attacting more FII interest. All these measure are expected to re-rate PSUs on par with Private Companies in terms of PE, if not more thus giving Above Average Gains. As you would have already guessed, my recommendation is INVEST. Most PSUs are BIG companies and are Leaders in their industries, in fact, many are virtual Monopolies. Thus this Fund will be like a Large Cap Fund. This Fund will is recommended for Long Term Investors. In the Last Year's Big Bear Crash, PSUs were the Least Affected thus giving a sort of comfort to investors. This Fund being a Proxy to PSUs and a proxy to the India Growth Story and thus, should make it to every Investor's Portfolio. BSE PSU Index has delivered 20% CAGR in the last 10 years and has outperformed the Sensex by 8%. Invest in small lump-sums instead of SIPs if you can track the sector and are prepared to book profits occasionally. The new fund offer (NFO), Religare PSU Fund, has raised Rs 229 crore from 37,000 investors. This is an impressive amount in an otherwise sluggish weather for equity funds. Indian investors have, on an aggregate, redeemed nearly Rs 2,123 crore more than their new investments in equity funds. The fund was open for initial subscription till on October 28. 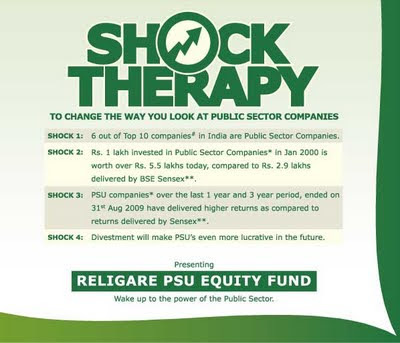 Religare PSU Fund will be the only thematic fund catering to the limited universe of public sector companies. However, the fund has a provision wherein it can invest up to 20 per cent of its net assets in other companies including former PSUs. This is the third NFO after the market regulator Securities and Exchange Board of India (SEBI) abolished entry loads in July, 2009, which came into effect from August 1. The other two NFOs were also unique offerings - Mirae Asset China Advantage and Edelweiss - The Absolute Returns Equity Fund.